Soft drinks are a very popular beverage and we all love drinking soda. This primarily consists of sugar, flavorings and carbonated water. As more and more flavored carbonated drinks are gaining popularity, there processing has become automated with the advent of machinery in every soda water plant , which has spawned the growth of this industry. How this happens : After the raw water TDS is removed from the R.O operating system, the TDS becomes very less. This water cannot be used anymore for drinking purposes. Since it needs reconstruction by bringing up the TDS value, this is done by adding extra minerals to the R.O system. This re-mineralization process is known as the Mineral Adding System. This is a process of chemical composition and involves vigorous processing. A team of trained and skilled professionals ensures that soda water is efficient in quality as per international standards. The manufacturing process : First begins the clarifying process, since the quality of water gathered from the mineral water plant in Kolkata is crucial to its success. Impurities like bacteria, suspended particles, and organic material have to be suspended or else it will degrade the taste. This is a three-step process- coagulation, filtration, and precipitation. During clarification, the technicians adjust the alkalinity in order to be able to reach the desired PH level. Then comes filtering- where the clarified water is passed through sand water to eradicate finer flock particles. This follows the process of sterilization where the harmful bacteria is destroyed and is pumped into storage along with a minute amount of chlorine. Then, an activated carbon filter is administered to remove organic matter and to de chlorinate the water. The next important process is the mixing of ingredients. The sugar and flavors are dissolved and pumped into separate stations according to their compatibility. Sometimes the syrup is sterilized using pasteurization process that quickly heats and then cools down the process. The ingredients are carefully mixed in batch tanks without too much agitation or else it can lead to unwanted aeration. The syrup and the water are combined using sophisticated machines known as proportions which regulate the liquid ratio. The beverage is then carbonated by controlling temperature of the liquid and carbon dioxide pressure. The finished product is then transferred into packages or bottles and the containers are immediately sealed. Before labeling, they are brought to the room temperature so that condensation of the matter can be avoided. The end process : It is very crucial for every manufacturer to ensure good quality of the product and maintain the standard of the product. The dissolved solids, sulfate content, iron, alkalinity, and other content have to be monitored. The preservative content should be allowed within restrictions. The National Soft Drink Association have set some standards that need to be followed by these units such as preventing spoilage, maintaining a clean environment, maintaining hygiene, keeping the sugar content within limits, etc. This is why one should always rely on a reputed consultancy who can provide reputed machinery for this procedure. 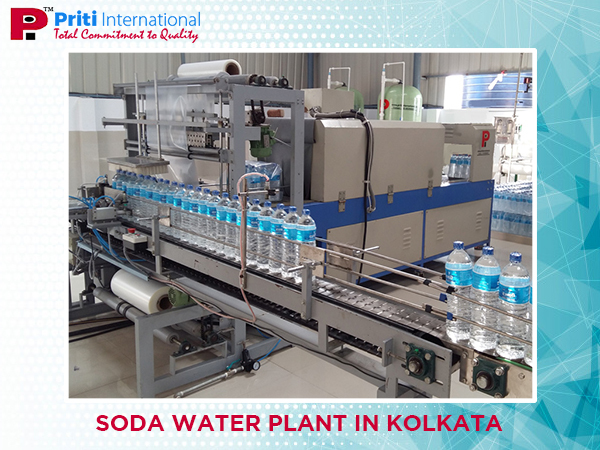 When it comes to manufacturing soda water, one can rely on “Priti International” has acquired a prominent position in this business. They work in accordance with international standards and maintain theirs in ensuring customer satisfaction. The machines available are components of renowned multinational companies like heavy-duty, durable motors, etc.